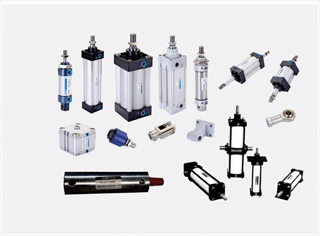 Standard range of Pneumatic Cylinders are designed to work at 10kg/cm2 pressure. Standard cylinders are available from 12mm bore to 350mm bore size with various mounting arrangements. Custom made cylinders are also manufactured according to the specific application requirement. Double Ended Cylinders, Single Acting Cylinders. Cylinders in different material of constructions – like Aluminum, Brass, S.S. & M.S. Cylinder with built in valves for continuous receprocation just like reciprocating pumps. Cylinders for high temperature applications above 80 degree centigrade upto 250 degree centigrade. Special Cylinders to operate in corrosive atmosphere, water etc. Cylinders with special mounting arrangements. Cable Cylinders for space saving & concentric load application & long stroke application. This range is manufacture from Bore size 40mm to 100mm & stroke ranging 500mm to 4000mm. Mounting Dimension 1-1/2" to 4"
Mounting Dimension 5" to 14"